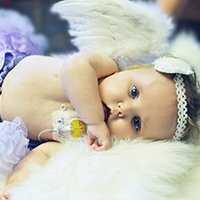 At two months old, Zuri was admitted to Children’s Hospital Colorado after doctors discovered a 6 cm tumor in the center of her head. Zuri courageously endured brain surgeries, chemotherapy, many trips to the emergency room, as well as extended stays in intensive care and hospital recovery rooms. She never stopped smiling, cooing, giggling, or loving everyone around her. Zuri loved her snuggle time with family, her blankies, and caressing ears as she fell asleep in Mommy and Daddy’s arms. Zuri spent most of August and September 2013 in Children’s Colorado after suffering a cardiac arrest and a stroke. It was during this final hospital stay when an MRI revealed that her tumor had become much more aggressive and spread into areas of her brain that could not be treated anymore. Zuri went home at the beginning of October on hospice care. She enjoyed playing with her toys again, going for walks, and snuggling on the floor with her big sister Echo every night at bedtime. When the time came for Zuri to leave us, she passed away nestled between Mommy and Daddy as they held her hands and kissed her face.